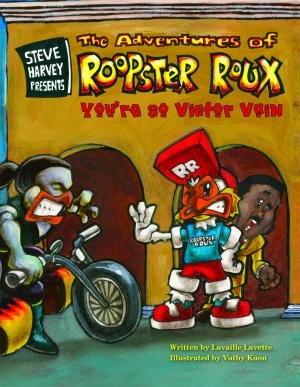 Following in the footsteps of the comical crime-fighting that took place in the first Steve Harvey and Roopster Roux adventure, That’s Not Punny, this book has plenty of surprises, wordplay, and energetic dialogue to keep even a reluctant reader’s attention. Lavaille Lavette served as a special advisor to U.S. Secretary of Education Dr. Rod Paige from 2001 to 2004. She has worked as an investment broker, schoolteacher, school district administrator, speechwriter, marketing executive, and international business development specialist. She is the author of four books in the Adventures of Roopster Roux Series published by Pelican: Slammin’ Slime, Surfing the Net, The Monster All-Stars, Escape from Vulture’s Roost, and Steve Harvey Presents: That’s Not Punny. Actor, entertainer, and philanthropist Steve Harvey continues his unending pursuit and commitment to furthering opportunities for children and young adults throughout the country with generous contributions from the Steve Harvey Foundation. Harvey has starred in a number of television shows (The Steve Harvey Show, Me and the Boys, Steve Harvey’s Big Time) and movies (The Original Kings of Comedy, Johnson Family Vacation, You Got Served, Racing Stripes). He is the host of the Steve Harvey syndicated morning radio show. Reading is valuable, and two friends doing right can accomplish anything.